This 1998 Bayliner Avanti 3485 is powered with twin Cummins 6BTA 5.9 200 hp diesel engines making this a very rare find and excellent value. This awesome diesel-powered vessel offers a great family cruising layout, with 6.5 feet of headroom, the brightest most open feeling express in her class. If you want a diesel-powered sport cruiser this one is a must see!The most aggressively priced diesel express on the market makes this a "MUST SEE". Call to arrange boarding. The Bayliner 3485 Avanti Express' lean profile suggests a vessel of superior performance and reliability, lots of open seating and sun berths, but barely hints at the surprisingly spacious cabin. Two separate double berths assure complete privacy for extended cruising. The head compartment features a shower, vanity with sink, and marine toilet. Large windows on three sides brighten the salon, where a raised dinette provides comfortable seating for four. The galley includes an alcohol - electric stove, refrigerator, and stainless-steel sink. Handcrafted ash cabinetry and accents complete a bright, airy environment below decks. Topside, the 3485 Avanti becomes an open-air entertainment center, with generous lounge seating and a full enclosure of acrylic weather fabrics. The flush aft cockpit leads through a molded-in transom door to a large transom platform, ideal for swimming, diving, or convenient dock access. A pair of V-drive inboards deliver quiet, dependable power. Bayliner's Avanti line combines dramatic, contemporary styling and leading-edge design with old-world skill and craftsmanship. Manufacturing teams apply leading-edge technology and meticulous hand-crafting to every stage of construction. A crew of technicians subject each new model to extremes of stress, endurance, and punishment to ensure that every Avanti exceeds every expectation. Avanti, the most luxurious cruiser in its class, features all the amenities of home. With its spacious cockpit and seating area, the Avanti is perfect for all-day cruising or entertaining. United Yacht Sales New Jersey would love to guide you through a personal showing of this 34' Bayliner 3485 Avanti 1998. 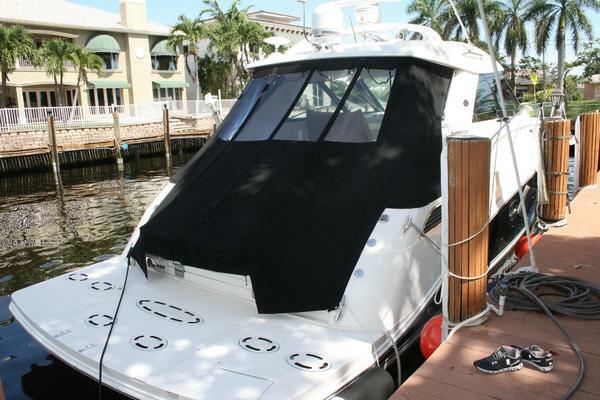 This yacht for sale is located in St. Petersburg, Florida and priced at $29,800. For a showing please contact us by filling out the form on this page and we will get back to you shortly! Boarding this vessel from the swim platform through a large transom hinged door to a spacious cockpit with optional bench seating (included) located to port and starboard, moving forward to the helm station (to starboard) with raised seating for five to port around a rectangular table provides excellent visibility for the helmsman and guests. Enter below through the companionway down two steps. The aft cabin is to port and the large head/shower is to starboard. Just forward of the head compartment is the galley featuring a large refrigerator, galley sink, microwave and two burner stove. Plenty of storage above and below. To port is a raised convertible dinette booth featuring seating for four. Forward is entertainment seating with game table area that converts to a double berth and has a privacy curtain. The boat features excellent provisions for storage space throughout.Overall the interior is very roomy for a boat of this size, and is well-illuminated with windows that are larger than most express cruisers.